Locality: Lai Chau, Dien Bien, Son La, Hoa Binh, and Nghe An provinces. Customs and habits: The Thai worship their ancestors, the heavens, the earth, ban, and “muong”. They also hold rituals to pray for good crops.The Thai live in houses built on stilts. Among the Black Thai, they prefer roofs that are shaped like a tortoise carapace with decorations called “khau cuts” at each ridge. A Thai man first lives with his wife’s family for several years until the couple has a child; they then move to the house of the husband’s family. The Thai organize funerals as a farewell party to see off the dead to the other world. Culture: The Thai language belongs to the Tay-Thai Group. They have a valuable legacy of myths, legends, ancient tales, versed stories, and folksongs. They like to sing and recite the “khap” along with the accompaniment of string instruments and a dance performance. 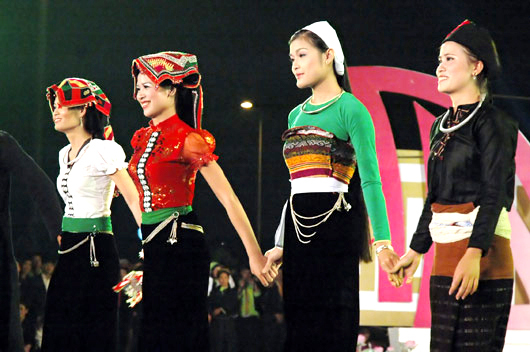 Their folk dances such as “Xoe”, “Sap”, “Han Khuong”, and “Con” are reflection of the Thai’s unique cultural characteristics. Costumes: The men have adopted the Kinh’s clothing style, while Thai women have retained their traditional clothes which include short vests, long black skirts, scarves, and ornaments. Economy: The Thai are experienced in cultivating rice and orchards. They also breed cattle and poultry, make bamboo articles, weave cloth, and produce ceramic ware.